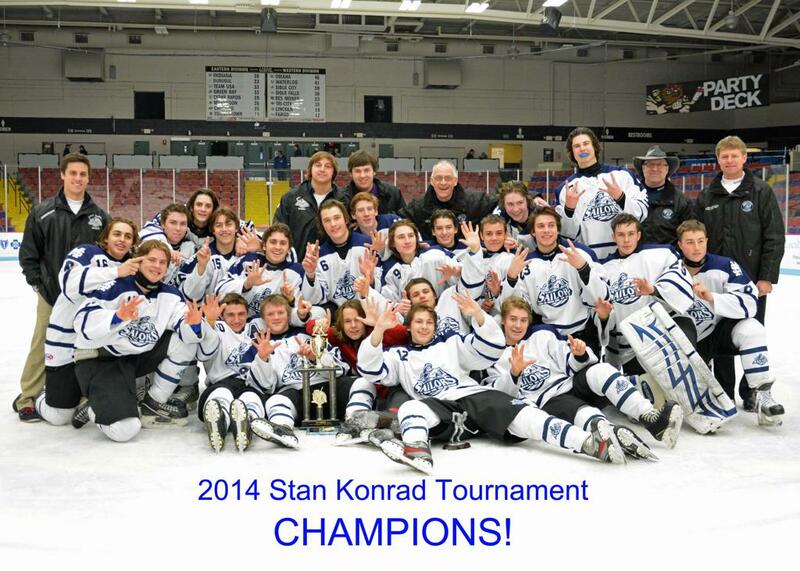 The Mona Shores Sailors Hockey Team is extremely proud to host the annual Stan Konrad Memorial Tournament. Stan Konrad, a native of Trois-Rivieres, Quebec, Canada, came to Muskegon in 1960 as a 22 year old to play for the Muskegon Zephyrs in the International Hockey League. 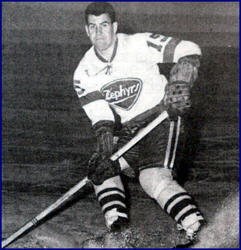 Stan’s career in pro hockey with the Zephyrs continued through the 1965 season and he is still regarded as one of the best to wear a Muskegon uniform. Stan Konrad still ranks in the top 10 in games played, goals scored, assists, and total points. Stan Konrad stayed in Muskegon after his playing career, and in 1974 became coach of the Mona Shores High School Hockey Club. Over a three-year period, from 1975 to 1977, Konrad’s teams put together an astonishing league record of 47-4-4. The Sailors were league champions in 1976 and 1977. In addition, Mona Shores won the league’s annual holiday tournament under Konrad in each of his three coaching seasons. More important to Stan than his accomplishments in hockey was his wife, Peggy and their children, Jim and Kay. Our deepest appreciation to the Konrad family for allowing us to share in the memory of Stan, who passed away on November 23, 1990. Timothy McClain has been thrust into a bigger role than he ever expected with the Mona Shores varsity hockey team. After all-state goalie Nate Rabbitt decided to skip his senior season to play in British Columbia and an injury sidelined senior Blake Graham, the Sailors have turned to McClain as the last line of defense. The freshman stopped 26 of 28 shots to help Mona Shores earn a 4-2 victory against Portage Central in Saturday’s title game of the 25th annual Stan Konrad Memorial Hockey Tournament at L.C. Walker Arena. “It feels amazing. Coming in as a freshman, it’s an amazing feeling to step up to this level and play with this kind of talent,” McClain said. The 14-year-old figured he would play on the junior varsity this season, but that changed with Rabbitt’s decision and a hip injury to Graham, which is expected to require surgery. Mona Shores coach Pat Rabbit has been impressed with the play of McClain, who played on a house team in the Muskegon Chiefs’ program last year. The defense helped McClain as well as the Sailors killed off a key five-minute penalty with a 3-2 lead late in the third period to hold off Portage Central. The game wasn’t settled until Mona Shores forward Alec Sturr was able to slide the puck into an empty net just as the major penalty was being killed off at the 15:41 mark. His unassisted goal clinched the Sailors their sixth consecutive Konrad title in the two-day event that honors the former Muskegon Zephyr standout and Mona Shores coach. The Sailors also got goals from Colin Rabach, Chandler Mancuso and a power-play goal from CJ Meyers in the third period that broke a 2-2 tie. Portage Central tied the game 2-2 on Jared Lutz’s score on a penalty shot that beat McClain on the glove side. John Hayward scored the other goal for the Mustangs, who fall to 4-6. Both teams finished with 28 shots and McClain was able to bounce back after Lutz was pulled down near the net and scored on the penalty shot for his fourth tournament goal. Sturr said the team has confidence in McClain. The win marked the third in a row and lifts Mona Shores to 5-4 overall. Sturr was named to the all-tournament team along with teammates Cory Sander and Ben Essenberg, named the tournament’s most valuable player. Essenberg had an assist Saturday to go with a three-point night in Friday’s 5-4 win against East Kentwood. Also named to the all-tourney team were Lutz, East Kentwood’s Sherman Mowery and Grand Haven’s Jake Steggles. 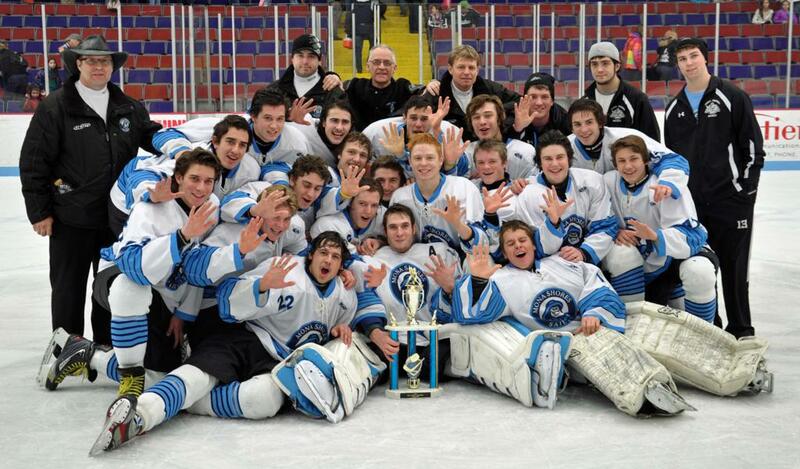 MUSKEGON – Depth carried the Mona Shores hockey team to the brink of another Stan Konrad Memorial Tournament title. The top-line players for the Sailors sealed the deal. Seniors Adam Ulfsax and Reed Hyrnewich scored third-period goals to help the host Sailors turn away never-say-die Grand Haven for an 8-6 victory in Saturday’s tournament championship game at L.C. Walker Arena. It was the fifth consecutive Konrad title for the Sailors, who improve to 11-0. Portage Central defeated East Kentwood 4-3 in the consolation finals. It didn’t come easy for Shores, which needed to post its third win of the season against pesky Grand Haven while playing over a rash of penalties. The Sailors built a 5-2 lead midway through the second period, but back-to-back power-play goals during a five-minute major and Ian Hibbard’s breakaway goal to start the third period tied the game at 5-5. Up stepped Ulfsax, who knocked in a shot from close range on a pass from Hrynewich at the 9:05 mark and Brandon Cottrell followed a little over a minute later with another goal to give Mona Shores a 7-5 cushion. Grand Haven answered with another power-play goal to make it 7-6, but Hrynewich fought off a couple defenders and answered with a goal for his 100th career point to close out the scoring. Ulfsax finished with two goals and an assist and had four goals in the two games for tournament MVP honors. Cottrell also scored twice and had two assists and made the all-tournament team. Senior Austin Swiatek also had a goal and three assists and goals from Glen Kastelic and Gage Veltman helped Mona Shores offset Grand Haven’s big scoring line led by Tom Zelenka and Ian Hibbard. Zelenka finished with a hat trick and added two assists for a five-point night to lead the Bucs and Hibbard added two goals and two assists. Both also made the all-tourney team. Grand Haven coach Dan Gadbois was pleased in their effort after Friday’s lethargic 2-1 win against Portage Central. Gadbois said it was the best Grand Haven played against Mona Shores in the three games this season. He was happy his team had another shot at Shores. Mona Shores jumped out to a 2-0 lead on goals by Cottrell and Ulfsax, but the Bucs stayed in the game although they never led. The loss drops Grand Haven to 7-4-2. For the Sailors, there’s little rest with a trip to East Kentwood waiting Wednesday. Rabbitt said the Sailors have broken the season into eight-game segments instead of looking at the big picture and they realize everyone will give them their best shot. He said being undefeated is a mixed blessing. 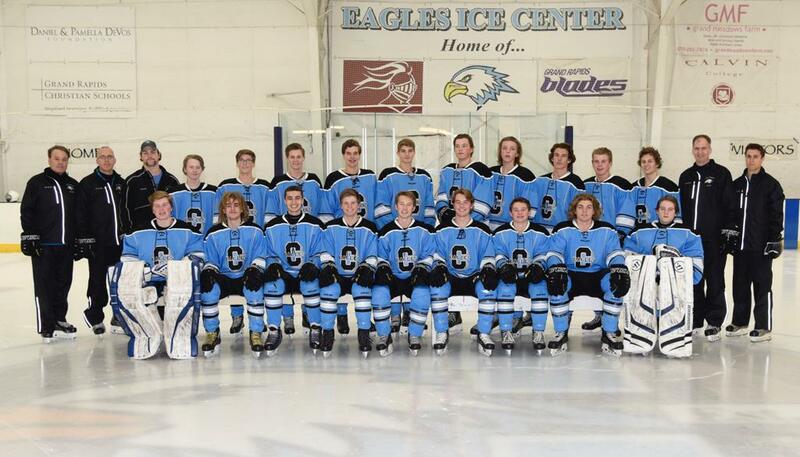 The Mona Shores hockey team clearly has things turned around. 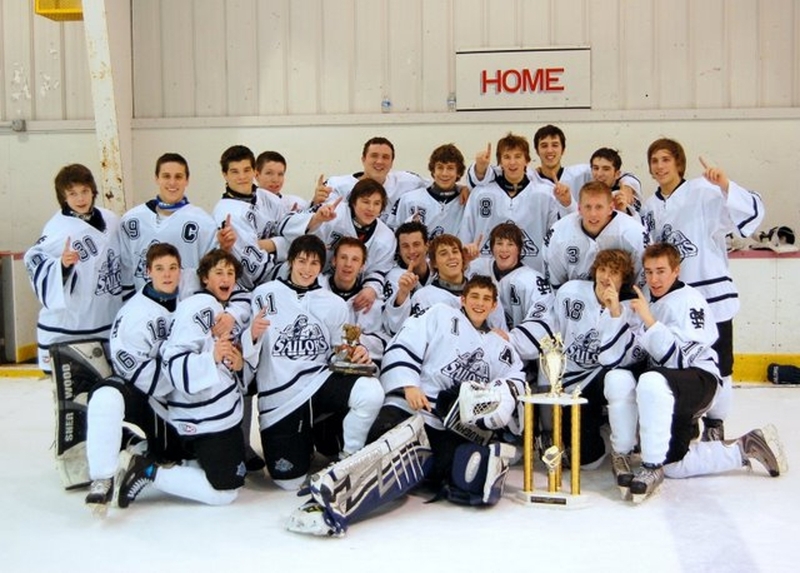 In a four-team Stan Konrad Memorial Hockey Tournament of reasonably evenly-matched teams, the Sailors made it look easy in both of their games. A day after routing rival East Kentwood 6-2 in the semifinals, Shores did it again to Portage Central, rolling past the Mustangs at Lakeshore Sports Centre by the same 6-2 score for its fourth straight Konrad title. "I would have predicted a closer game with EK, but we did a good job of finishing it off," said Shores junior foward Reed Hrynewich, who was named the tourney's MVP. "We're definitely getting a lot stronger. We're a young team and we've gotten tougher the more we've played." The Sailors left little doubt who was the best team on the 23rd anniversary of the tournament, at least at this time of the season. The hosts scored three first-period goals and led 4-0 through two periods. The most impressive part came from the Shores defense, which blocked shots and played well positionally to not allow the Mustangs many opportunities to score. The collective play by the Sailors' defense earned them one of three game pucks from the Shores coaching staff. "They did what they're supposed to do," Shores coach Charlie Link said. "They played a great game. "We keep focusing on the little things, and when you do those well it leads to big things." Hrynewich and Austin Swiatek led the offense with two goals apiece. Gage Veltman started the scoring with a goal midway through the first period. Hrynewich then took over with goals 35 seconds apart late in the period. "I guess it means a lot to be named MVP," said Hrynewich, who added an assist. "It all started with our goalie (Nate Rabbitt) and our defense doing their jobs. Nothing happens without them." Swiatek, who had two assists for a four-point night, scored the lone goal of the second period. Justin Renda scored 4:02 into the third period to spoil Rabbitt's shutout bid, but Swiatek and Brandon Cottrell tallied the next two goals to put the game away. Colin Rabach collected two assists for the Sailors, who went 2-for-4 on the power play. Shores prevented Portage Central from scoring on any of its five power play opportunities. "It takes a little time for the kids to get used to the system," Link explained. "We're really young this season and I think we're just getting comfortable with everything and making the plays we need to make." Mona Shores capped off the weekend with a 3-1 victory over Portage Central in the 22nd annual Stan Konrad Memorial. This victory clinched the Championship trophy for third consecutive season. After a hard fought triple overtime game with Kentwood on Friday night, no one knew how much the boys had left for the championship game on Saturday. 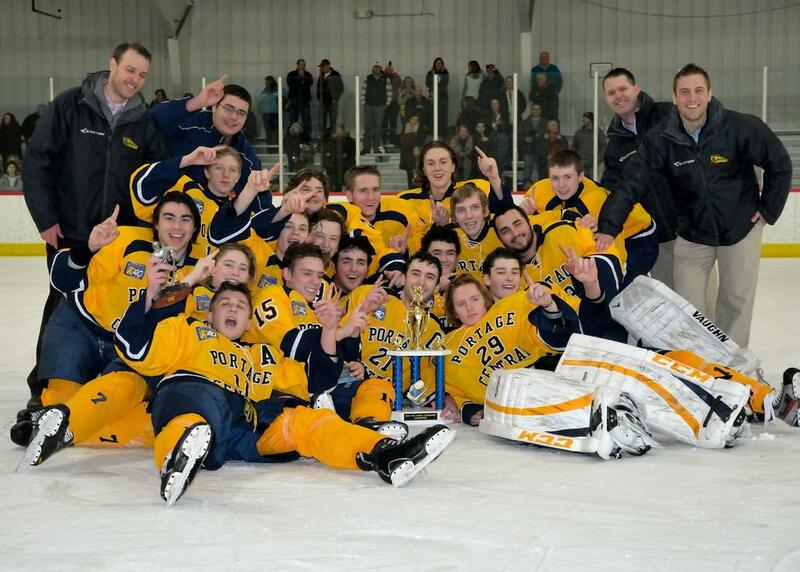 The sailors dug down deep in the third period for three goals to take home the big hardware. Coach Link said after the game "a fitting end to an emotional week Russ would have loved it"